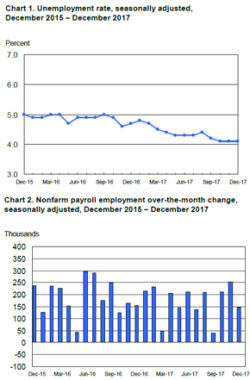 CNBC noted that the December figure for employment creation did fall short of numerous projections, and represented a drop of more than 100,000 jobs from November 2017, during which revised BLS numbers state that the economy added 252,000 jobs. These economists and other experts had expected a gain of about 190,000 new positions. However, the relative shortage of workers available to fill jobs – as evidenced by static 4.1 percent unemployment, and a similarly steady labor force participation rate of 62.7 percent, began to take its toll. Most of the other sectors tracked by the BLS did not see any noteworthy growth or contraction. Retail trade proved to be the exception, with a decline of 20,000 positions. This may appear surprising, given that MasterCard recently announced a record-setting 4.9 percent increase in holiday sales across the U.S. Yet that drop was in line with 2017’s trend for the industry, as it lost 67,000 jobs over the course of the year, a reversal from the 203,000 retail positions added in 2016. David Berson, chief economist at Nationwide, told The Washington Post that the continued rise of e-commerce may have helped that decline. Yahoo Finance noted that overall 2017 job growth makes the lack of notable expansion in American employees’ wage rates throughout the year puzzling to a significant number of economists. All told, despite December numbers falling below expectations, 2017 can accurately be considered a good year for American jobs, which will brighten employers’ expectations as 2018 begins.